Are you having knee pain with walking, getting around the golf course, or getting through your gardening for the day? At SOS Physiotherapy, we provide custom bracing and Orthopedic supplies. We also carry a wide variety of wrist, knee and ankle braces, along with foam rollers and other useful products to support your rehabilitation processes. The Rebound line of hinged wrap or sleeve knee braces offer “off the shelf” support for ligament and meniscal sprains and strains, mild knee instabilities and gentle support for osteoarthritis. 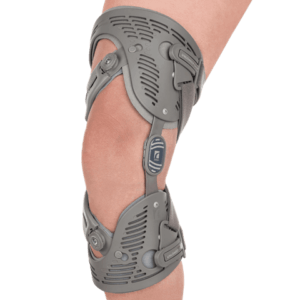 These braces are fully adjustable, breathe freely and offer patella or knee-cap support to control where it counts. Light rigid hinges add extra control against rotational movements and uneven terrain. These braces are often used to treat “Jumper’s Knee”. They work by applying pressure to the tendon to help alleviate pain. They are a soft, nylon material that breathe well and adhere nicely to different contours of the knee joint. Easily adjustable with a velcro strap. Provides stability and protection for the ankle for chronic instability or following an injury. Its low profile, quick-lace design is comfortable and fits easily into shoes. Removable semi-rigid stays provide additional support and the Figure 8 straps are designed for inversion/eversion control. The Speedlace allows for quick application and removal. Best used for mild to moderate ligament sprains, chronic instability or prophylactic use. The Spectra wrist brace is designed to immobilize the wrist at a neutral angle. Its single-pull lacing closure makes it easier to apply than a conventional wrist brace, meeting the needs of patients with arthritis, mild tendonitis, or mild to moderate wrist sprains and strains, carpal tunnel injury. Designed by an orthopedic surgeon & sports medicine specialist. Easily Customize the fit by gently squeezing or flattening the plastic plates. By compressing across the flexor, extensor and supinator muscles, BandIT turns normal forearm activity into a pump action that aids in the relief of tennis elbow and carpal tunnel. The Posture Medic is a resistance band based brace that helps to cue the individual in obtaining and assuming a good postural position while sitting, standing or being active. The brace pulls gently on the shoulders and upper back to unload the neck and to help place the toros in a neutral position, away from the forward, flexed, sitting posture we all migrate towards throughout our busy lives. The brace can also be used as a light resistance band to perform your postural strengthening exercises provided by one of our physiotherapists! A foam roller is a tool that is used for what is called “self myofascial release”. Our muscle and connective tissue can often become filled with “knots” or “trigger points” and feel tight or lumpy. This can in turn cause imbalances around joints within the body and ultimately result in dysfunction and pain. The foam roller provides a solution to allow you to release these adhesions through a gentle rolling motion over top of the adhered tissue. Your physiotherapist can show you some great ways to use the foam roller today! Function better with the OSSUR Unloader One custom Knee Brace. SOS Physiotherapy is a proud provider of many excellent OSSUR bracing products. Our patients have had great success with the Unloader One® in restoration and reducing their pain, for even severe knee arthritis and it is covered under most insurance plans! Call our clinic today and learn more about how a Custom Knee Brace could help you!